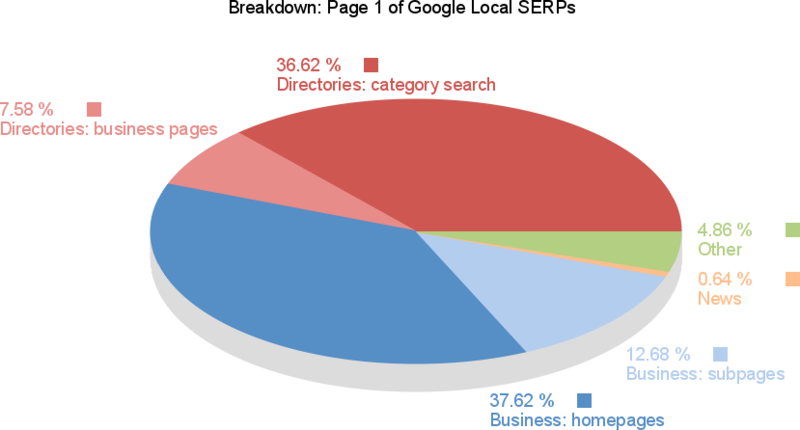 Breakdown of Page 1 of Google’s Local Organic Search Results: Who Dominates? 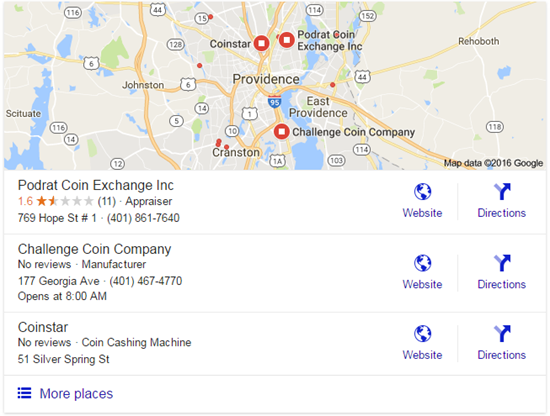 Though the first page of Google’s local results usually consists of 3 “local map” results plus 10 organic results, that doesn’t mean your business has 13 chances to rank somewhere on page one. Nor do all pages on your site have an equal chance at ranking. Nor does having the most-dominant site necessarily mean you’ll get the most or best visibility in the local results. 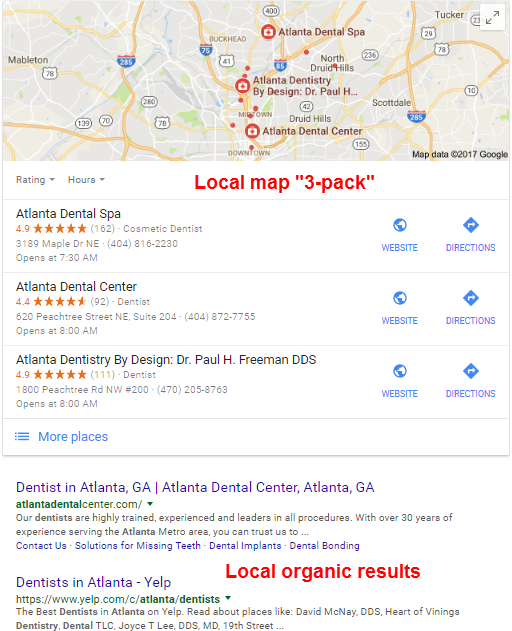 How well your business ranks in the local “3-pack” depends on many factors, including where your business is, where the searcher is, who clicks on you and other behavior, the name of your business, and – above all – on how well you rank in the local organic results (the “10 blue links,” usually right below the local map). Your organic rankings, in turn, depend mainly on how relevant your site is to what the customer searched for and (even more so) on how good your links are. 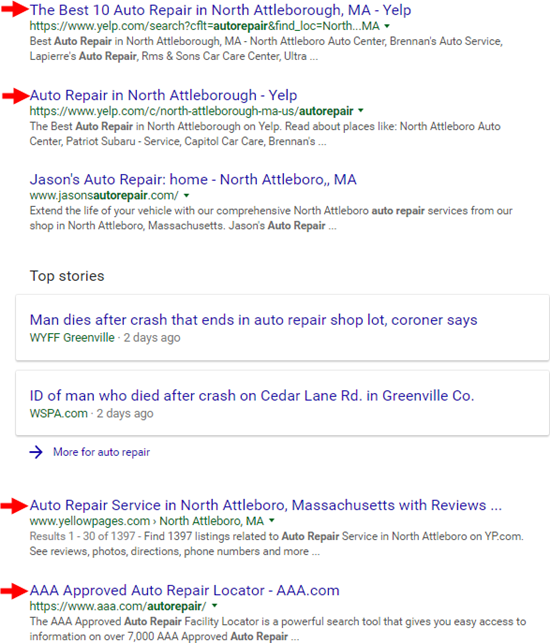 So what are your chances of getting your business’s site to rank somewhere on page 1 of the local organic results? One way to answer that is to know how Google usually fills up the first page of local organic results – Google’s tendencies and quotas, you might say. Google has a very specific way of carving up the local search results. It’s not all local businesses, nor is it a grab-bag of “something for everyone” search results. 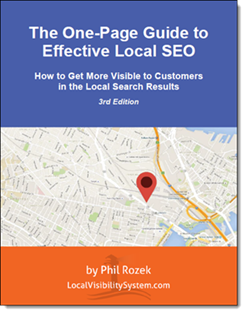 I’ve just done a study of 500 local markets – 500 first-pages of local search results – and have some numbers on which sites and pages typically rank on page one. Here’s the pie-chart, which sums up my findings and the dozens of hours of research that went into it. You may not need to know any more. Or you may want more detail on the pie, on my methodology, and on what it all means for your local SEO strategy. In the latter case, just read on. What does each slice of the pie represent, exactly? I’m referring to the homepage of a site that belongs to a specific business. Homepages are the biggest slice of the pie, averaging 37.62% of Google’s local organic search results. On average, 3-4 out of 10 of the organic results consist of one homepage or another. The homepage typically has the most link-juice (which is one reason I usually suggest using it as your Google My Business landing page). It’s no surprise to me so much of page one goes to various homepages. If homepages constitute more than 3 out of 10 spots on a typical first page of results, that must mean other pages usually grab the other 7 spots – right? Wrong. Subpages (like yourbusiness.com/city) and subdomains (like city.yourbusiness.com) only account for 12.68% of the 5000 individual search results I studied. In a typical first page of results, only 1-2 results are for pages on a business’s website other than the homepage. So 37.62% of the results are for businesses’ homepages, plus 12.68% are for other pages on businesses’ sites. That’s about half of the pie. 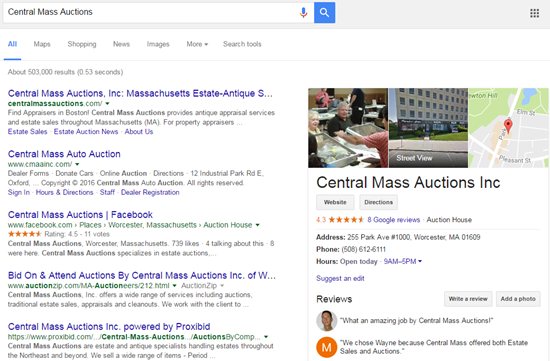 Who gets the other half of Google’s local organic search results? It probably doesn’t surprise you that local-business directories take up a lot of real estate on page one. I’m talking about Yelp, BBB, YellowPages, and so on, and industry-specific sites like Zillow, HealthGrades, TripAdvisor, etc. Those directories’ internal search results show up more often than do other pages on their sites. “Search results within search results” take up a whopping 36.62% of Google’s local organic results. Sometimes a business’s Facebook or Yelp or BBB or YellowPages page will rank on page one for a popular search term. Known as barnacle local SEO, it’s great if you can get an online property other than your site to rank for a main keyword. But it’s tough to do. 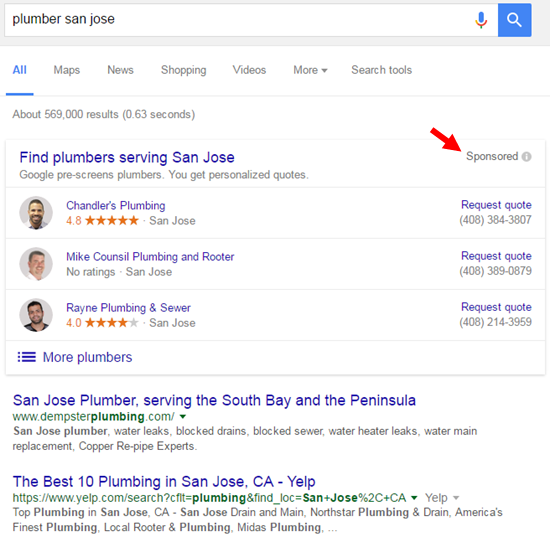 Only 7.58% of Google’s search results go to directory results for specific businesses. Local-news sites and other sources of news take up a small piece of the search results (not as much as I thought they would). News results made up 0.64% of the results I studied. Google throws other results onto page one, too. 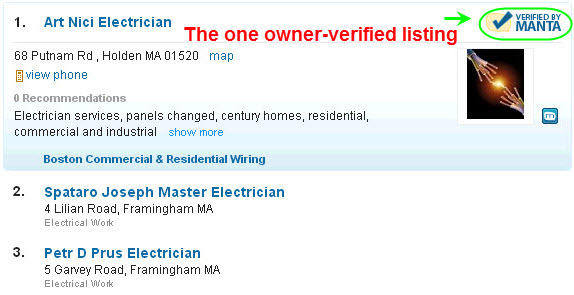 The most-common “other” sites I ran across were Craigslist listings, Indeed.com (for jobs), weird directory results (e.g. 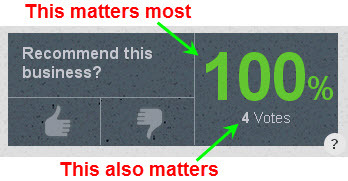 Yelp forum threads), and government sites – usually local government. When Sydney Marchuk (of Whitespark) and I did this research, we tried to be as methodical and scientific as possible. As with most studies, there are limitations to this one, and I’m sure there are some holes. We searched for explicitly local search terms: “city + keyword.” As opposed to typing in “keyword” and seeing what local search results Google shows you. 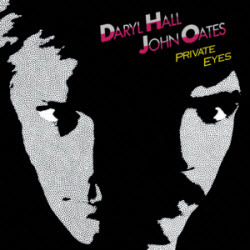 (Yes, Google is watching you.) In my experience, the results differ a little between when you type in the city and when you don’t. To do a study on that would be more technically complicated and even more of a slog, but I’d love to do one or see one some time. As I said at the start, we didn’t include the Google Maps “3-pack” rankings in this analysis. Again, we just looked at the localized organic results – which usually contain all the business that rank in the 3-pack. Sydney lives in Canada, but searched at Google.com (not .ca), was signed out of Google, and used an incognito browser tab. The results weren’t biased by search history or anything like that. In any case, I live in Massachusetts, and the searches I did matched up with what Sydney found. We did the research in mid-December – about a month ago. Some of the SERPs surely have changed since then, but I doubt they’ve changed significantly. To the extent I’ve had to spot-check some of the results in the past few days, I’ve found that they’ve changed very little. Of course, the breakdown will change over time. It’s Google. They like to twist the dials. On average, only about 5 of the results are for specific businesses. Your other competitors are directories. Wherever you can’t beat ‘em, join ‘em. You’ll get some visibility either when people click on the directories’ “search results within search results,” or if you get your listing or page itself on the site to rank on page one of Google’s local results. That’s often just a matter of piling on the reviews. Homepages dominate, especially in markets where smaller, locally-based businesses duke it out mostly with each other, and not as much with Big Ugly Corporations that happen to have a nearby branch. Again, homepages tend to have most or all of the link juice. Assuming you’ve got at leasta few decent links, if you have some good local content on your homepage it should have a good chance of ranking well. Subpages (example.com/city) tend to be more dominant in markets where big businesses tend to congregate (e.g. car rentals). I have my theories as to why that is, but that’s for another day. Given how Google splits up the real estate between directories and businesses’ sites, dominance isn’t a matter of just getting your site to rank. As I’ve said, it’s not about site vs. site; it’s reputation vs. reputation. Any questions on my findings? Any conclusions you’ve drawn (that I didn’t mention)? P.S. If for some crazy reason you want to do an (unrelated) study of your own, consider hiring Sydney to help (schedule permitting). You can email me, or connect with her on LinkedIn. Local SEO without the Local Map: What Is It? Google is still in the early stages of injecting ads into the Google Maps 3-pack. 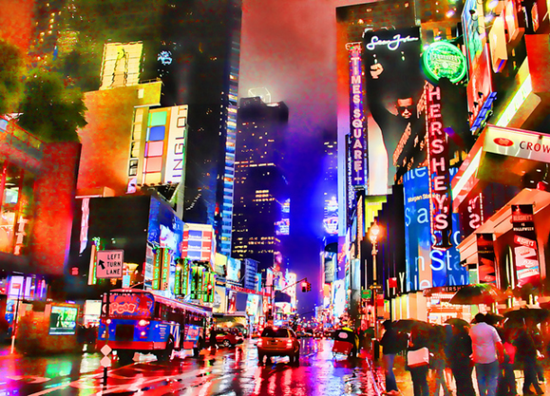 Google never met an ad it didn’t like, so the only question is when (not if) the map pack will become Times Square. 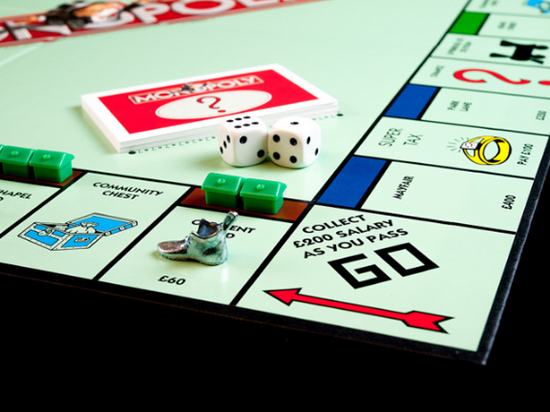 The thought of a pay-to-play local map scares the bejeezus out of many local business owners and local SEOs. Will you lose your seat at the Local Feast to a big dumb corporation that can shovel more money into AdWords than you can? Or, if helping people with local SEO is your business – and you don’t do PPC – will you be lying in chalk? 1. As long as there are local customers, local businesses, and the Web, there will always be local SEO. It’ll just continue to morph over time, as it always has. 2. Your “Google Maps” visibility has a huge amount of overlap with other areas of online marketing – particularly with your organic-search visibility (read: your links and content) and with how good you are at earning reviews on a variety of sites. 3. The local map is not the holy grail. Keep in mind that I make a living in large part by helping businesses get visible there, so I’m the last guy to say it’s not important. But I’ve seen people dominate the local pack and not get any new business. Also, Google can always mess it up (even more), lose the trust of searchers, and reduce the potential payoff. If your one source of leads is your Google local-pack rankings, you are mooning a lion. 4. Local SEO is not just about rankings (duh). When you need something, do you automatically hire whomever ranks #1? Neither do most people. Local searchers are not a captive audience. Most of them will dig until they find a business they trust. Visibility in Google is only one part of becoming that business. Fine, but what do you do if Google’s local map becomes prohibitively expensive, or worthless, or disappears entirely? What’s left? Is it Van Halen without David Lee Roth? Branded search results. When people look up your business by name, can they immediately tell your site belongs to you and not to a sound-alike competitor? Are they impressed by your customers’ reviews of you on all the review sites that show up on page 1 for your name? Have you received any local press? Are you listed on niche sites? Organic visibility. 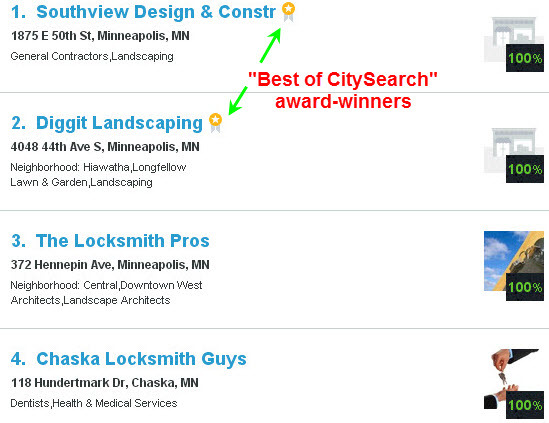 It’s usually the business with the best organic visibility that ends up ranking best on the local map. Often, that comes down to strength of your links. But you may also want to write blog posts on extremely specific topics in your industry or city, or create good “location” or “city” pages, or both. Arguably even now you’re not necessarily better off if you rank well in the local pack but not in the organic results; they’re neck-and-neck. But if the local pack becomes a total trash heap, your organic visibility pays off even more, because people will go back to looking there for all non-ads search results – just as they did before Google Places came onto the scene. Barnacle SEO. Getting your Yelp, Facebook, YouTube, or other non-company-website, non-Google online properties to rank for “local” keywords can help you haul in more leads, even when your other rankings aren’t so good. Facebook. It’s slowly waded about shin-deep into the local pond, but there’s no reason to think the shirt isn’t coming off. It’s only getting more important, and there any many ways to use it to get more local customers. Other local search engines: Apple Maps and Bing Places and Yahoo. Local directories or review sites. 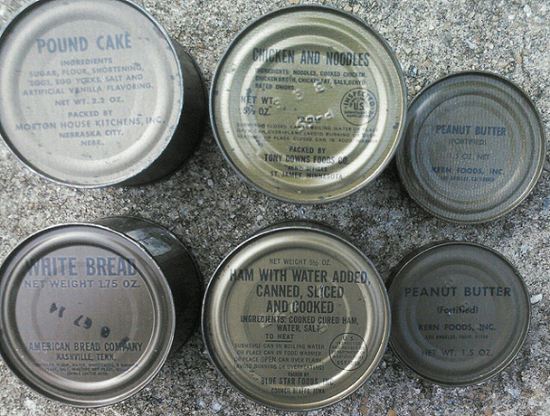 Not the rinky-dink ones, but rather places like Yelp, Angie’s List, and maybe even nasty old YellowPages. Industry-specific directories or review sites. Zillow, Avvo, HealthGrades, TripAdvisor, DealerRater, etc. Those are the big names, but even small niches have directories, and you should pay attention to them. Sites and apps not yet created. Local search in general has gotten bigger over the years, not smaller. It’s become more of a part of everyone’s life, and will continue in that direction. If Google’s local map results change significantly or go away, it’s not the beginning of the end, but maybe just the end of the beginning. Now, I would be surprised if the local map ever becomes 100% pay-to-play, and I’m certain that it won’t change to that overnight. But you still want a bunker plan. That means you need to stock up the bunker with MREs and batteries and road flares and ninja throwing stars and whatever else before all hell breaks loose. That’s why, even if the local map-pack remains free and a meritocracy at least in theory, I suggest you work on the things I just described no matter what. What are some important non-Google-Maps aspects of local SEO? What’s in your “bunker plan,” in case the local map gets too pay-to-play?